The summer is a time for fun. Kids are out of school and are ready to have a blast all summer long. At Wheels Skate Center in Odenton, MD we are committed to giving the kids a great summer schedule full of fun activities. Our Summer Fun Skating flyer shows you an anticipated exciting summer. We will be having special times and deals that you are sure to love. You will not want to miss out! Starting on June 26th, our summer skate deals will begin. Every week Monday through Friday from noon to 3 pm, we will have our summer fun skate time. The best part for parents is that it only costs $5 per visit! That includes admission for your child as well as skate rentals. 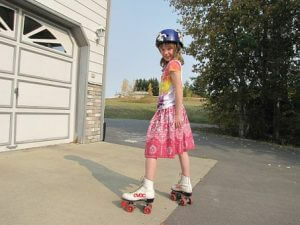 We have quad and inline skates available that are well-maintained and carefully cleaned. At our summer skating sessions your child will get to skate to some of their favorite summer songs. Our music is appropriate and fun for all ages. Can’t get enough of summer skating? We have another summer deal you won’t want to miss! If you are a working parent and want to ensure your child has fun and stays active, our all day skate is the best option for you. For just $25 a day your child will be able to enter the skating center, enjoy a delicious and nutritious breakfast, hit the rink and skate, break for some incredible pizza, and skate some more before it’s time to head home. After work you can swing by Wheels Skate Center to pick them up. But be careful walking in: the smile on your kid’s face may encourage you to take a sick day and join us! We are excited to offer these deals to you this summer at Wheels Skate Center. Roller skating is a great way for kids to stay healthy while also having fun. We can’t wait to see all of the kids having a great summer. If you have any questions about these deals, please do not hesitate to contact us.